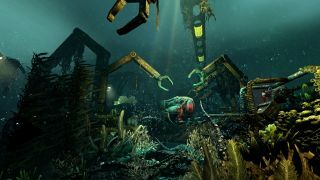 Soma is the next game from Frictional Games, the developer of Amnesia: The Dark Descent. Like Amnesia, it's a horror game, albeit this time with a sci-fi edge. It's set underwater, and last week we got to have a look at some of its environments. In this new trailer, the focus is instead on the creatures that players will come across. It may start with sharks, but it gets scarier. Of course, sometimes things are scarier before you see them, so you may not want to watch this trailer at all, but if you do could you let me know what you think the narrator is saying at around 0:22? I just can't quite catch it. Soma is due out pretty soon, on September 22. If you haven't yet decided whether you're going to give it a shot, check out Andy's hands-on preview.